In 1983 Bob Chambers and Michael Conroy sought a competition sanction from The United States Weightlifting Federation in order to hold the Idaho State Weightlifting Championships. The meet was held August 5th at the Boise City Recreation Center and 23 athletes from Idaho, Washington, Montana, Oregon and Utah competed. Barry Stone, of Utah, just edged out junior lifter Sam Maxwell, of Washington, for the Best Lifter award. A second competition was held in January of 1984. Bob Chambers, who was originally from Arizona, returned to his home state and Conroy was left along to set up competitions. Conroy asked for a third sanction in July of 1984 and at that time he was contacted by USWF Director Harvey Newton. Newton asked Conroy if he would be willing to act as LWC (Local Weightlifting Committee) Chairman and help reactivate the old Snake River LWC. This LWC would oversee the sport for All of Idaho, Eastern Oregon and Northern Nevada. The Snake River LWC had gone 'dormant' in 1967 and no one could remember, for sure, when the last time a sanctioned weightlifting meet had been held. The reactivated Snake River LWC was short lived. In December of 1984 the USWF decided that Idaho should become its own LWC, since Oregon and Washington where their own LWC's and Northern Nevada had been assigned to the Pacific LWC. January of 1985 was determined to be the new 'start up' date and Idaho received the number 59 as its LWC ID number. (The Idaho LWC was the 43rd recognized LWC). A small 'glitch' was made in giving Idaho its name. Instead of receiving the LWC or Association designation it was named "Idaho Weightlifting Federation". In February of 1985 Mike Vierra, of McCall Idaho, sought the first club membership. "Team Idaho" was the states only club from 1985 until 1990. 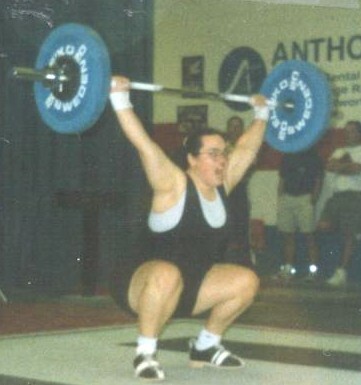 In 1987 Vierra returned to his native California and in 1991 Conroy registered the club as "Idaho Weightlifting" which was the only sanctioned club in Idaho until 2013 when several other organizations registered clubs. Conroy has served as the chairman of the Idaho LWC since its 'founding' in 1985. Morrison-Knudsen graphic artist, Cory Watson, created the logo design, which is Viktor Sots, URS, snatching 190kg in the 100kg class at the 1982 World Championships, imposed in front of a line drawing of the State of Idaho. In 1985 Brian Neilsen became Idaho's first National Champion when he captured the 60kg Gold Medal at the AAU Junior Olympics. Brian was also the first Idaho Weightlifter to be named to the National Junior Squad. Conroy was the first to win a National Masters Championship when he captured the 90kg class in 1990. Conroy and John Fransen where the first lifters to qualify for a Senior National Level Championships when they competed at the inaugural American Open in 1991. (Conroy would place 9th 4 straight years. As well as being the oldest competitor 4 times) Conroy was also the first to receive a National and International Coaching Assignment when he was named to the Junior National Squad Camp in 1991 (an assignment he would keep until 2004 when he was named to the Coaches Committee) and served as an assistant coach to the 1991 and 1992 Junior International Cup. In 1993 the United States Weightlifting Federation changed its name to USA Weightlifting in accordance with the USOC's new designations of National Governing Bodies for the sports under their jurisidiction. Kristy Adamson was Idaho's first Women's National Champion when she won the 70kg title at the 1994 Junior National Championships. Jan Marlett was Idaho's first women's University National Championship winning gold in both 1996 and 1997 as well as being name to the National Junior Squad in 1998. In 1994 Conroy became a certified National Referee. In 2010 and 2011, Kollin Cockrell secured not only National Championships and spots on both the Junior World and World University Teams, but a scholarship to LSU/Shreveport. In 2012, Paul Morganroth captured his first National Championship and position on both the Youth National and Youth World Team. In June, 2012, Conroy accepted the position of Director of Coaching Education for USA Weightlifting, a post he keep until February of 2017 when he stepped into a support staff role for USA Weightlifting. From 2013 to 2016, the Idaho LWC has made steady progress in both number of clubs and athletes making a continuous presence at all levels of national competitions. In April 2017, Shay Carlock will compete at the Youth World Championships in Bangkok Thailand.